Happy Fools’ day folks! Hope you enjoyed my little inversion series. 🙂 I believe this will be the last such post for now. I’ll get back to normal puzzles tomorrow mostly(or maybe take a break tomorrow for other things and get back on 3rd). For those following my CTC exploits, I believe I can finally officially confirm it(I’m banking on nothing happening in the last half an hour or so, that would be cruel 😛 ) that I have finally, and I mean FINALLY topped the CTC timings for a day. 30th March was the day. 1. This puzzle has exactly 2 solutions. In each solution, every clue must behave at least a little bit differently. 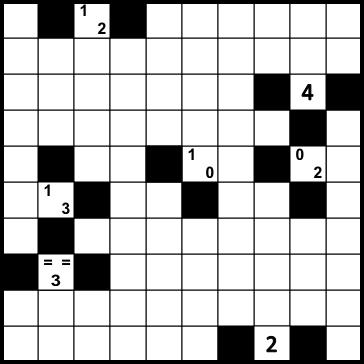 This means, in a multi-digit clue, some of the digits can have the same behavior, but not all. 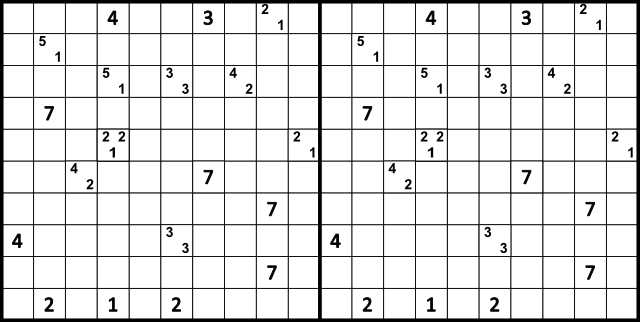 The uniqueness of this puzzle lies in getting both the solutions simultaneously. 2. Draw two separate walls in each case, not touching each other(diagonal touching allowed). The walls can be of any length, but there must be exactly 2. Solution here. Password – TPS. 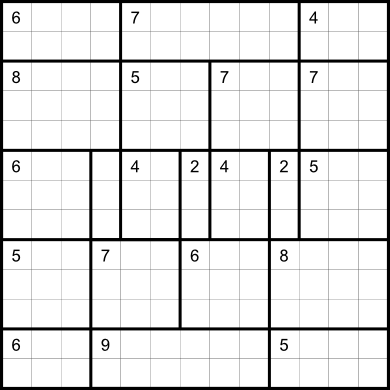 Rules for this : The numbers show the different blocks of connected unshaded groups within the region. The numbers are all wrong. The number of numbers that there should be are also wrong. e.g. a 14-18 clue means there won’t be any unshaded group of 14 cells, or of 18 cells, and there cannot be exactly 2 groups of unshaded cells in that region. Rated : Hard due to unfamiliarity, and general confusion. Follow regular Tapa Rules. Draw two separate walls, not touching each other. I’m sure this has potential to be a nice variant, but I just made it up in the last 1 minute for the sake of it. Edit : The bold part is added later. There’s already been a variant called Double Tapa, but I didn’t remember it while making this coz of the no touching rule, and I was silly enough to omit that from the rules here too. Thats what happens when I’m bored Apologies. Right. 2nd puzzle of the day. Btw, TVC XII this weekend. I may have well and truly screwed up chances of being 1st among Indians, but hey, some of the puzzles seem to have great potential and I look forward to a fun test. IB and submission link for the test here. There’s one big difference. All the clues that are shaded MUST be true and all the clues that are unshaded MUST be false. The clue cell itself is not included in its clue-count. i.e. If there is a 3 pointing towards its right, for there to be three shaded cells to its right, this 3 must be shaded too. If its unshaded, there cannot be 3 shaded cells to its right. I did say I’d have two puzzles up today didn’t I? 😉 Nah, just kidding, I’ll have another one up in 4-5 hours I think, possibly later, but surely by the end of the day. Anyway, Follow regular Tapa rules. This puzzle has 2 solutions. The same clues cannot have the same behavior in both solutions. In multiple digit clue cells, it can be similar, for example the “3” of a “3-1” clue can be placed the same way, but at least the “1” will have to be different then. 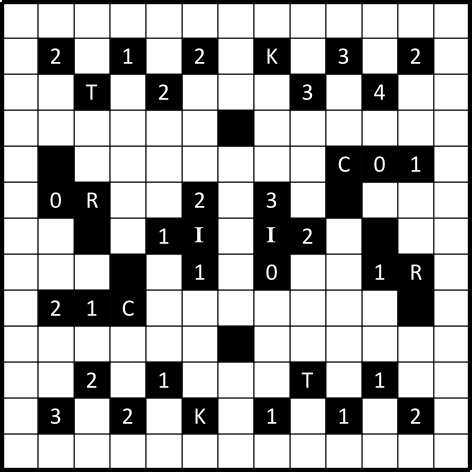 The uniqueness of this puzzle lies in the fact that you get exactly one solution for each set of behaviors for the clues. 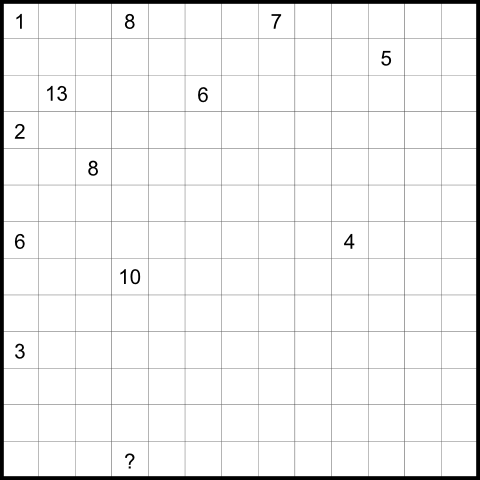 As such, I’ve provided 2 different grids for solving. 1. I was feeling I owed something after yesterday’s weak idea. 2. I honestly didn’t know which to choose from these. 3. I had a slight bit more time on my hands. I suppose all are rated around easy. Here, the clues are kept outside the clue cell. Each number needs to occupy at least 1 black cell adjacent to it. Rules are otherwise unchanged. 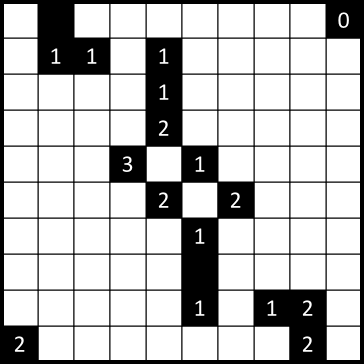 The “=”s mean those 2 clues will occupy two different adjacent clue cells and both be the same number. 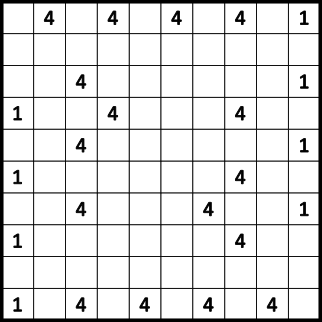 Rules : Every number is wrong and will be replaced by another number to solve the Akari puzzle. Even numbers can only be replaced by odd numbers and vice versa. Zero is considered even. 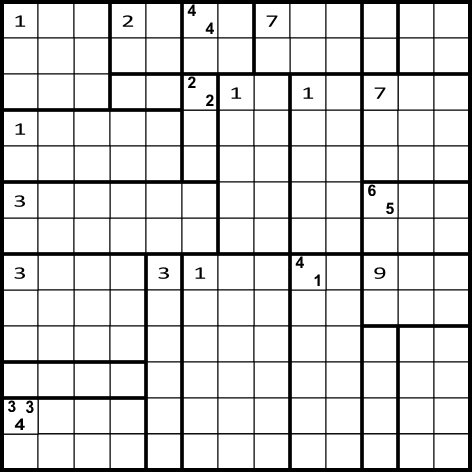 Similar to above, except here there are clusters of clue cells that have to switch places. 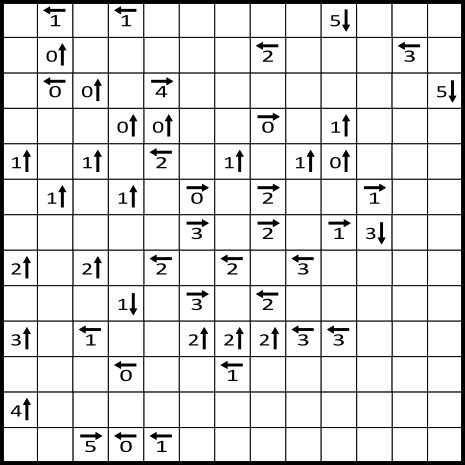 There are certain letters and every clue cell they can reach(touch diagonally or orthogonally by traveling through numbered cells only) is part of that letter, and can switch with the symmetrical cluster twin of that letter. I know this is complicated, I goofed a bit. But what this means is, e.g. 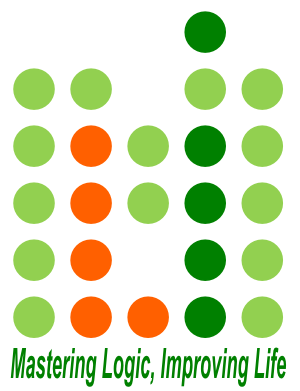 the T on top left reaches those 4 cells around it, and in these 4 every even cell must switch with any odd cell in the T at the bottom right, and vice versa. The “2” to the right of the “I” cannot be reached by the “C” since there is No numbered cell in between and so isn’t part of the C cluster. The switch needn’t be 1 to 1. X take Y’s place, Y can take Z’s place, Z can take X’s place and so on. Only restriction is the place changing should be between the cluster twins only. Yes, week title, I know thats not even how Heyawake is pronounced. Its probably a week continuation of the inversion series too. The title, because I can’t think of anything else except sleep right now. The week<actually non-existent> idea, because I’m utterly disconnected in everything after something thats occurred today. Apologies. Anyhow, I still think its a pretty good puzzle. And the series continues. On a second opinion, puzzle’s fine. Thanks to Murat for confirming. Anyway, follow regular Nurikabe rules. 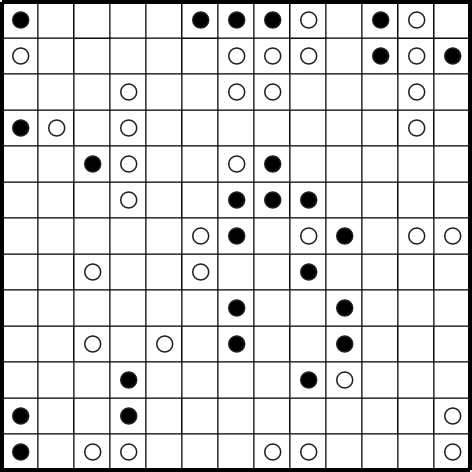 Difference is, Every single clue is wrong, and has one and only one peer among the other clues of the grid. Once the clue and its peer switch places they will be correct clues. The “?” clue has no peer, and its length will be forced(this is mainly because I apparently don’t know what even numbers are). Same number clues cannot be peers of each other. e.g. the 2 8s below must each have some other number as their peer. Puzzle No. 105 : Y-YU-NO-MAS?? Isn’t it funny how, sometimes you get so clogged up in few negative aspects of your life that you forget about the things you have going for you? I got reminded of those things today, and it put me in a good enough mood to get an idea. I checked with a friend on the series I plan to put over the next few days and he thinks its good, so I’ll go along with it 😛 Here’s the first one. Since I haven’t made any of the rest yet, I can’t make any promises though. What changes here is, ALL the given circles are wrong, and all possible circles are given. Confusing? Then read on. 1. The loop will NOT do the (turn at a black circle and not turn immediately after) thing. It may do anything at a black circle except that. 2. The loop will NOT do the (go straight through a white circle and turn immediately after on at least one side) thing. It may do anything at the white circle except that. 3. ALL cells the loop passes through that do not contain circles, must behave as if they contain either black or white circle of a regular Masyu. i.e. if the loop passes through a cell that doesn’t contain a circle, figure out which of a white circle/black circle of regular Masyu behavior is possible for this cell and proceed accordingly. 4. The loop needn’t pass through all cells in the grid but must pass through all the cells with circles.